Rules were made to be broken, or at the very least bent and this week, we're going to have to bend our own rules just a bit. Rule bending historically has resulted in some great things. For example the New England Patriots secretly video taped their opponents practices and they won three Super Bowl titles. In the 1986 World Cup Quarter final match, Argentinian footballer Diego Maradona used his hand, well at least partly his hand, and maybe partly God's hand to direct a goal, and his national team past the British team. Wine historically has been fairly bound by tradition, blends commonly still follow those rules, and many times this is done because of that respect for tradition as well as that Rhone varietals blended together tend to make a really nice wine. But when you step outside of those rules, or make your own sometimes the results turn out really nice. When it comes to value priced wines you tend to see this rule bending applied a bit more liberally. What can happen when it's done well is a completely different wine experience. This week's Friday Find, our first Friday Fudge is the $22 Railway Red from Bartholomew Winery. The unconventional blend is Cabernet, Pinot Noir (yes, that's right) and throw in some Syrah and Malbec. Bending the rules? Bart is straight smashing them. So by comparison, two dollars is really nothing. The wine comes off as uber-approachable, the Pinot Noir mellows out the Cabernet structure and you get a super drinkable food friendly red blend. This wine kind of reminds me of the Sokol Blosser blend Meditrina that was recently put to rest, may she rest in peace. A great burger or pizza wine this blend will go with damn near anything. Go pick this up at the tasting room down in SoDo, in the old Rainier Brewery. 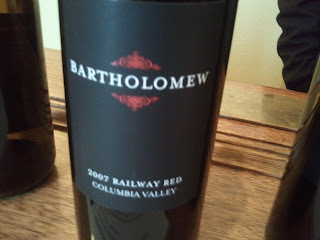 You can also find this blend in Bellevue at George's and the Matthews Thriftway and in Lakebay at Blend.